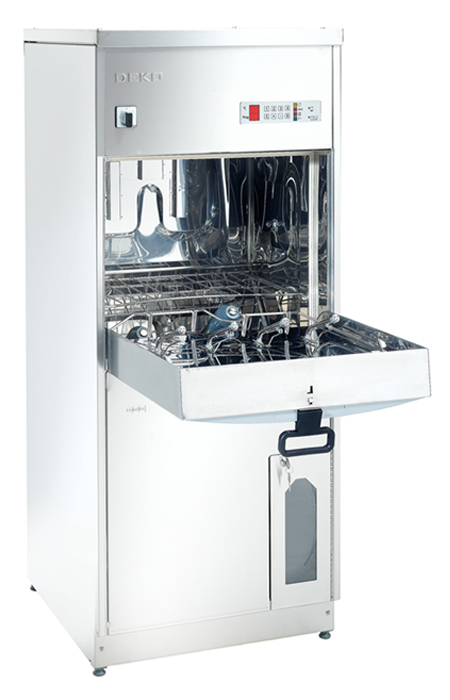 The DEKO 190 Bedpan Washer is designed and constructed to meet the standard performance and design requirements stated in ISO 15883-1 Washer-disinfectors – General requirements and in ISO 15883-3 Requirements and tests for washer-disinfectors employing thermal disinfection for human waste containers, together with, the Safety requirements stated in IEC 61010-2-045: Particular requirements for washer-disinfectors used in medical, pharmaceutical, veterinary and laboratory fields. Water pressure for washing is supplied by a high powered 600L/min recirculation pump. Detergent is injected into the re-circulated wash water by the automatic integral dosing system. The steam disinfection phase is generated by the integrated non-pressurized boiler and is directed through the water tank, outlet and internal pipework. Easy programmable wide selection of disinfection temperatures and cycle setups to secure the microbial inactivation impact. Cycles can be modifed to meet almost any special requirement, though the standard requirements are met with the fixed, tested and approved cycles pre-programmed by the manufacturer. The access code system protects any unauthorized changes to the set parameters. The washing spray patterns are delivered through 3 rotating + 8 fixed spray jets guaranteeing contact with all surfaces and crevices of items with varying design. 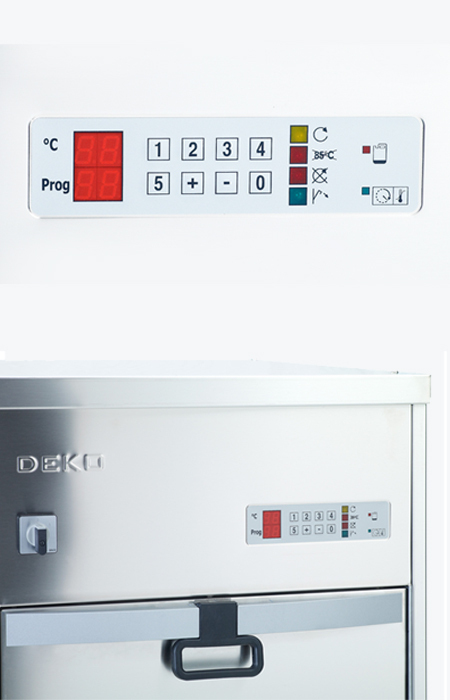 DEKO 190 has a large wash chamber and capacity for automatic emptying and processing of 2 bedpans with lids and 4 urine bottles simultaneously. The integrated drop down shelf provides space for 4 hand wash basins or a mop bucket with seating ring. 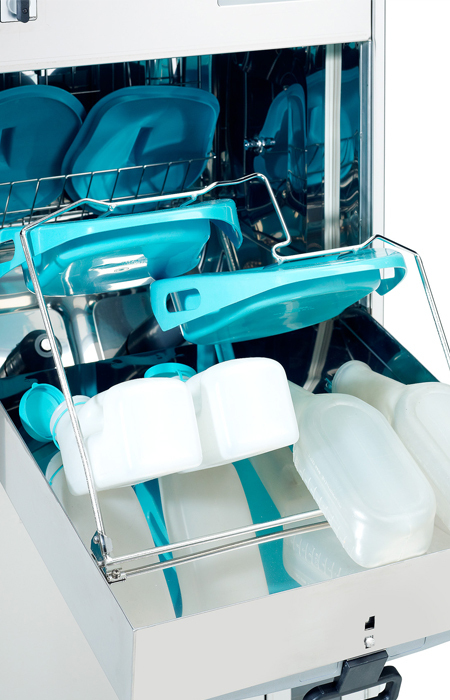 The shelf can also be utilised as a base to accommodate and process inserts and washing accessories e.g. kidney dishes, bowls, vases, toilet brushes / holders, as well as, various hollowware. 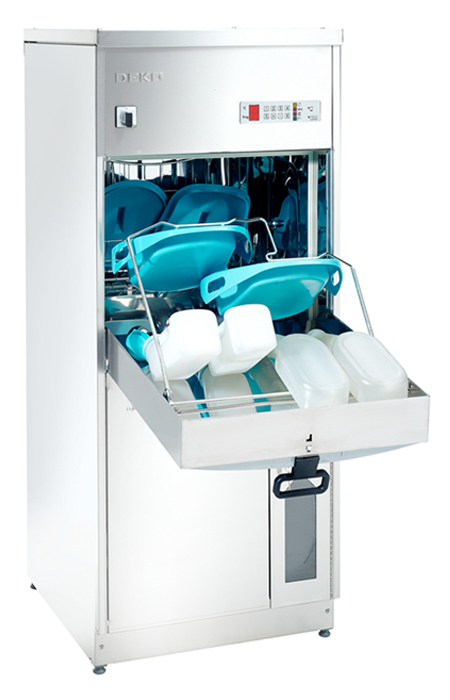 Using optional holders and baskets enables the correct positioning and easy loading of various items, eg; suction jars & medicine pots, and extends the DEKO 190’s capacity and versatility. The door is locked securely throughout the cycle. A green indicator will advise when the door is unlocked for opening. An audible indicator may be added to draw attention to the ending of the cycle. In order to guarantee that the values of the critical process variables were truly obtained and as programmed, the Deko 190 is equipped with the verification level A – independent temperature verification sensor. Cleaning efficacy is increased by dosing automatically the precise pre-determined volume of detergent at the correct time of the wash cycle. The detergent container is safely positioned into the easily accessible housing. The intelligent control system monitors the washing pressure constantly and secures the achievement of the pre-set process values. 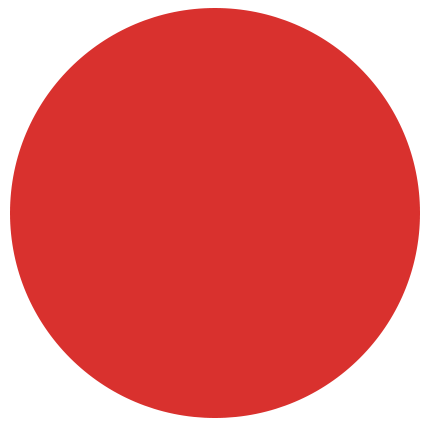 A low level detecting system will illuminate the red indicator to warn when the detergent volume is running low. 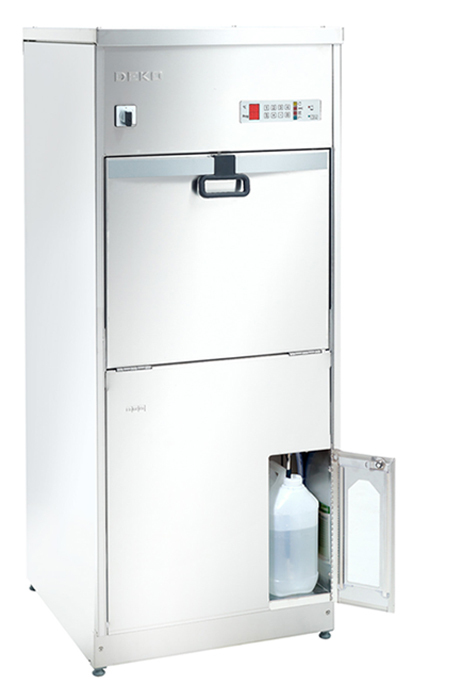 The DEKO 190 occupies its space efficiently. One unit requires only W600xD630 mm of floor space. Connections to water, electricity and drain are provided with all necessary safety features. Regular control & maintenance of the machine is made quick and easy by the service mode of the microprocessor and the easily accessible components. Water is taken into the chamber from the integrated water tank. User and Maintenance Manuals include all relevant details and instructions required. Any information, advice, personnel training and service calls are attended to with the utmost dedication and urgency. Availability of spares is guaranteed for a minimum of 10 years after date of shipment and the complete programme and software lodged securely with an independent body. Durability and reliability in continuous, heavy and busy institutional operating circumstances have been the key factors in the design of the Deko 190. 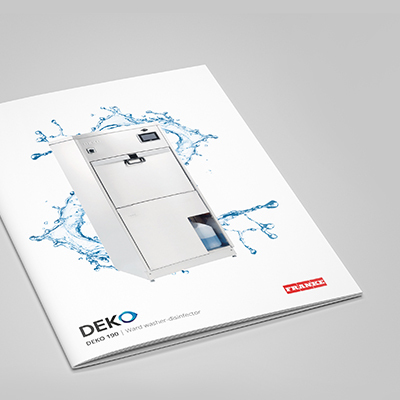 The DEKO 190ix presents the latest technology in user interface applications in washer-disinfectors. Information & control panel provides the means to view cycle information real time and view the remaining cycle time. Also included is an automatic cycle counter and the intelligent software provides advice on service actions. 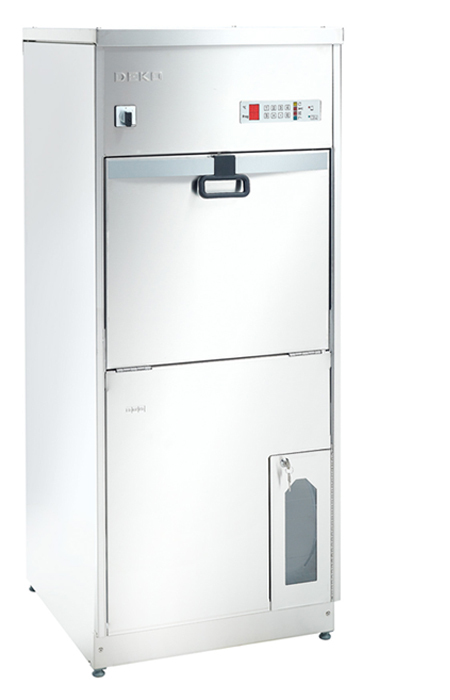 The DEKO 190ix’s door opens & closes smoothly and is locked securely throughout the cycle by the automatic locking system. The clear text on the display and the cycle complete indicator will inform the operator when the cycle has been completed. The in-built condenser prevents the escape of excessive steam and minimises the moisture within the chamber at the end of the cycle. An automatic ‘Non-Touch’ door activated by an optical sensor is available as an option only on the ix model.